Is the little light in your dash that depicts an engine glowing so orange it makes you feel blue? Well your car is just trying to tell you about what is likely a small problem that needs to be dealt with before it turns into a bigger issue. If the light comes on bring your car to a local mechanic to have the issue diagnosed right away to prevent the need for more expensive repairs. The following are four of the most common reasons that light may come on, but it could be any number of issues. The best thing you can hope for when the light comes on is just that you forgot to tighten the gas cap after filling up. If the cap is cracked, loose or broken it can allow gas to evaporate out of the filler hose, causing the light to glow thanks to detection of the gasoline vapors by the EVAP system. The ignition coil creates the spark that gets the engine going when you turn the key. If it has trouble producing the spark the light will turn on. The coil is subject to pretty rough abuse over the years and is bound to wear out at some point. Operating your car in extreme hot or cold temperatures can shorten the life of the coil. Your vehicle runs off a mixture of gas and air. The mass air flow sensor monitors incoming air and determines how much of it needs to be mixed with the gasoline to create a properly running engine. If the sensor malfunctions the light will glow. This is generally a cheap repair that needs to be done as a bad MAF can decrease fuel efficiency by up to 25 percent! The catalytic converter converts dangerous exhaust fumes into less hazardous emissions that are sent out the tailpipe of your car. If it is unable to complete its job the check engine light will come on. Unfortunately this is a pretty expensive repair for most vehicles. But for the catalytic converter to go bad something else likely had to fail first, such as a bad MAF or O2 sensor, which would have triggered the light to come on beforehand. This is an example of why it is important to have the check engine light diagnosed right away - to avoid more expensive repairs. If your check engine light is on bring your car to a local mechanic right away. It is important for the health of your car! For check engine light diagnostics Covina for any make and model be sure to visit Hye Tech Auto. 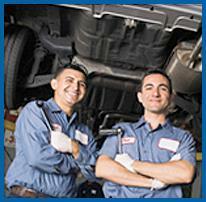 Our superior auto repair techs have access to the latest diagnostic equipment, ensuring fast and accurate repairs. At the first sign of trouble give us a call at (626) 332-5452 to schedule an appointment for expert auto repair in Covina.